Story Line: Aliens invade Earth and a language expert must decipher their message before it's too late. Director Denis Villeneuve has been making something of a name for himself recently for mastering gritty, intense and suspenseful thrillers. Prisoners (2013) was especially bleak (brilliant, but bleak) as Hugh Jackman sought revenge for the kidnap of his daughter; whilst last year’s Sicario (2015) received widespread acclaim for its tale of Emily Blunt’s idealist who becomes embroiled in moral ambiguity when the FBI goes to war with a major drugs cartel. His next offering will be the sequel to Blade Runner. It was intriguing, therefore, to discover that Villeneuve has branched out into Sci-Fi here with Arrival, in which 12 alien spacecraft descend on Earth and station themselves at random locations across the globe. Whist alarm bells may ring that this sounds suspiciously like the premise behind the likes of Independence Day, thankfully the comparisons do stop there, and Villeneuve has in fact delivered one of the most intelligent, creative and insightful Sci-Fi movies of recent times. In Arrival, a US Army Colonel recruits language expert, Dr Louise Banks (Amy Adams, also in cinemas right now with Nocturnal Animals), and military scientist, Ian Donnelly (Jeremy Renner) to analyse and decipher what the aliens are saying. They discover that it is impossible to do so from audible language, but they are able to work with the alien’s written language which comes in the form of circular, smoky, ink-like images. As Banks and Donnelly spend more time with the aliens, they start to uncover their real intentions on Earth and face a race against time to convey this message to the world before drastic action is taken by other nations. In her efforts to decipher the language, Banks is haunted by the memories of what happened to her daughter, Hannah. This is revealed in the heartbreaking opening sequence which is accompanied by Banks’ narration as she explains that “there are days that define your story beyond your life”. This notion, as well as the recurrence of Hannah, becomes symbolic of one of the key themes of this story; the idea of the predetermined. It’s something which hints at common Sci-Fi themes such as time-travel and parallels, but this theme’s ultimate purpose is to ask the question of whether or not you would do anything to change your life when you know what is going to happen. The circular shape of the alien’s messages and the deliberate use of a palindrome for Hannah’s name prove to be devices which enhance this concept further. It’s a thought-provoking quandary. 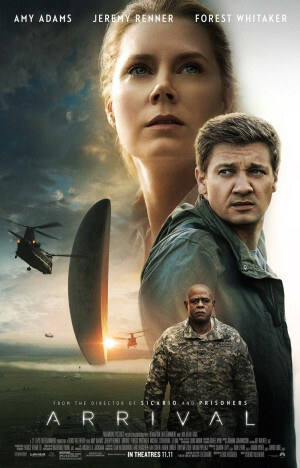 Whereas this could generally be cast aside due to the Sci-Fi context, Villeneuve manages to make Arrival much more Science than Fiction and as such creates a profound sense of realism around the entire production. He achieves this by various means, but his use of imagery is key. The spacecrafts themselves are colossal, frightening, looming structures that hover stationery above the ground yet are almost featureless beyond their unusual lens-like shape. Likewise, the aliens are huge; so big in fact that Banks and Donnelly only ever see their bottom halves, depicted as mollusc-like creatures with seven arms which they use to draw their messages. Both designs serve as a reminder that there is a much bigger force at play affecting our lives, again enhancing this idea of the predetermined. At the same time, Villeneuve creates an element of mystery behind these shapes and designs; what is inside these strange, hovering objects? What do the aliens look like in their entirety? In providing the audience with visual reminders of the unknown and undiscovered, Villeneuve also manages to imply that whilst our stories may be ‘defined’, we don’t necessarily know how or why. Of course, Villeneuve is also aided here by solid performances from Adams and Renner, both putting in wonderfully restrained turns. Adams in particular is excellent as Banks, whose determination to see out her task whilst being plagued by memories of her daughter brings her to the edge of obsession. It’s a fantastic of piece of character development as Banks initially comes across as rather uninteresting and bland, but once the momentum gathers it is clear to see that the character and the performance are entirely purposeful, as is every other aspect of this film. Finally, the focus on language also plays a significant part in reinforcing the themes within Arrival. It’s a fascinating study of linguistics, both scientifically and evolutionary speaking, and is used here to once again remind us that there are unknown factors determining our paths. As Arrival reaches its conclusion, we discover the real reason why the aliens have come to Earth and whilst the build up to this point is intelligently and exquisitely formulated, the basis of their purpose feels surprisingly weak and short-sighted. 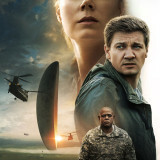 Ironically, despite the film being so adept at developing the notion of a circular lifecycle, it perhaps needed to be another 10 minutes or so longer so that the audience could obtain some degree of closure on the impact of the aliens’ invasion. This is perhaps the only flaw here, and it is a minor one at that. Arrival is a majestic, beautifully created piece of cinema that is steeped in melancholy and flows with a real elegance. There are plenty of comparisons to be made to this, from the classics such as Close Encounters of the Third Kind to Christopher Nolan’s Interstellar and Inception (the spacecraft tunnel scenes are very much reminiscent of the latter), and also Gareth Edwards’ Monsters, whose aliens draw similarities to the ones here. However, Arrival feels that bit more taut, succinct and complete, almost effortless in its delivery and more profound with its message.